This neologism seems to get used in two ways in English, but I think anti-boycott is probably the most common. The wikipedia entry USED to say: It has many names: “buycotting,” ethical consumerism, moral economics, latte activism, critical consumption. Whatever you call it, buying is getting ever more political across the affluent world. A car is no longer just a car, nor a cup of coffee just a cup of coffee. In the age of hybrids and fair trade, the mall is a forum to express convictions and hopes. 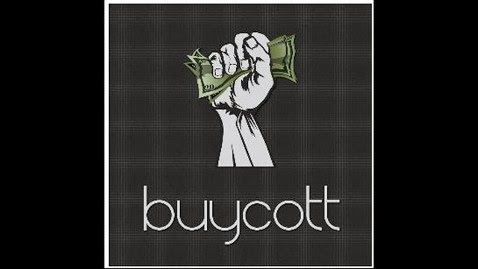 An anti-boycott or buycott is the excess buying of a particular brand or product in an attempt to counter a boycott of the same brand or product. It is also sometimes, incorrectly referred to as a "counter-boycott" (which, by the definition of "counter" would actually be the boycotting of another product/brand in response to a boycott). The usual reason for an anti-boycott is to prevent a company or entity from backing down on the decision that initially caused the boycott. The anti-boycotts by supporters of Israel to oppose Boycott Israel campaigns. When Whole Foods Market was boycotted because the CEO opposed U.S. President Barack Obama's health care reform policies, opponents of health care reform staged nationwide Buycotts.